Sorghum is sensitive to the competition of weeds, especially in its early stages. Successful weeding is a key stage of crop management. Controlling summer grasses is particularly challenging. First, sowings must be undertaken on a clean soil, and plots of land likely to be invaded by summer grasses (such as proso millet and Johnsongrass) should be avoided, as there is no efficient chemical solution against them. Sorghum is a demanding crop during sowing. It is important that sorghum emerges quickly and homogeneously to facilitate weed control and limit competition between sorghum and summer grasses notably. Due attention must therefore be paid to seedbed preparation and to the quality of sowing in order to obtain a satisfying soil-seed contact, and to sow on a warm soil (soil temperature must be higher than 12°C) at a sufficient depth (3 to 4 cm) allowing to limit the sensitivity to herbicides, particularly root graminicides, used on filtering soil or before a rainy period. 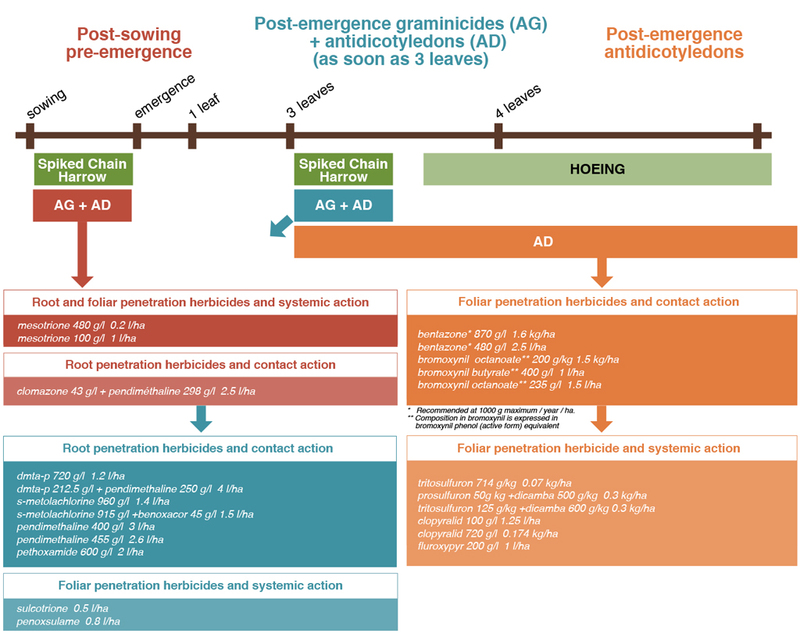 usable herbicides for sorghum cultivation and their positioning. The possible strategies depend on the range of solutions available in the various countries. Face with the constant pressure of more and more weeds and dicotyledons, pre-emergence strategies remain the best bet in terms of efficiency. Indeed, competition may happen early, as soon as sowing, and until vegetation covers the row spacing .i.e. around 8-10 leaves for sorghum, depriving weed below of light. It is important to take action on emerging grasses before the 2-3 leaves stage. This also applies to classic dicotyledons. In this case again, superficial soil humidity during treatment and in the following days is essential to the success of weeding particularly for root penetration herbicides. Use at the 3 leaves stage of sorghum guarantees a good product selectivity margin vis-à-vis the crop. This treatment essentially concerns dicotyledons (annual and perennial) and requires a simultaneous emergence of weeds from the seedling stage to 4 leaves stage (for annual weeds). Mechanical weeding solutions allow completing and securing weeds control in cultivation. Spiked chain harrows or rotary hoe can be used a few days after sowing (“blind” preparation technique), provided seeds were sown a bit deeper. Hoeing (with ridging) can be done at least once around the 5-6 leaves stage of sorghum.